Cousin™ Stretch Cords (elastic and thin plastic kinds from 4 pk) 48 ft. Spread a towel out to put all of your supplies on. This keeps the beads in place. Since the thinnest plastic cord comes wrapped around a card it has bends in it. Use a hair dryer to blow hot air on the bends to make the cord straight. String the beads then the bird charm on an eye pin. 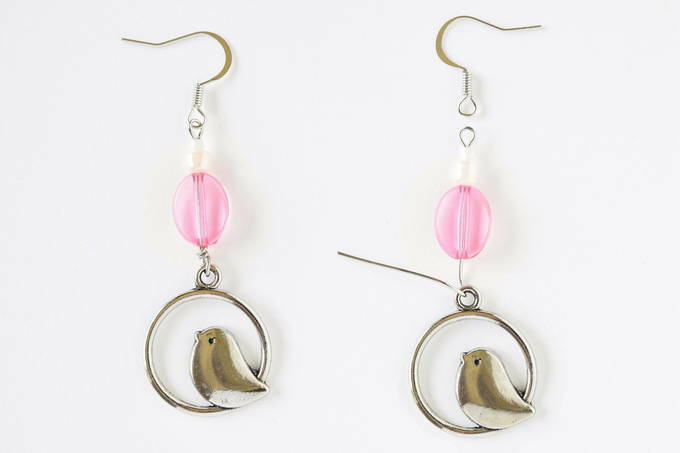 1/8” below the bird charm, hold the eye pin with the round nose pliers. Use the chain nose pliers to bend the eye pin wire to the side. Hold the beads up and let the bird charm drop into the bend. Holding the bead section and the bird charm apart, wrap the straight end of the eye pin two times around the exposed eye pin wire just above the bird charm. Cut off the excess wire. Press the end down so it doesn’t stick out. 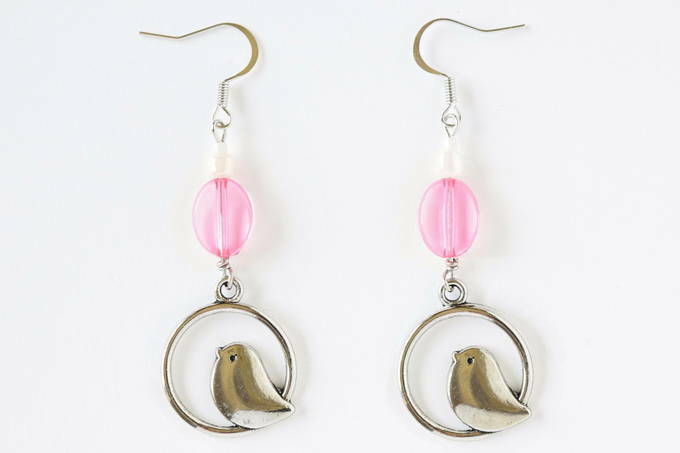 Make sure the earring hangs from an ear properly with the bird on the front side. 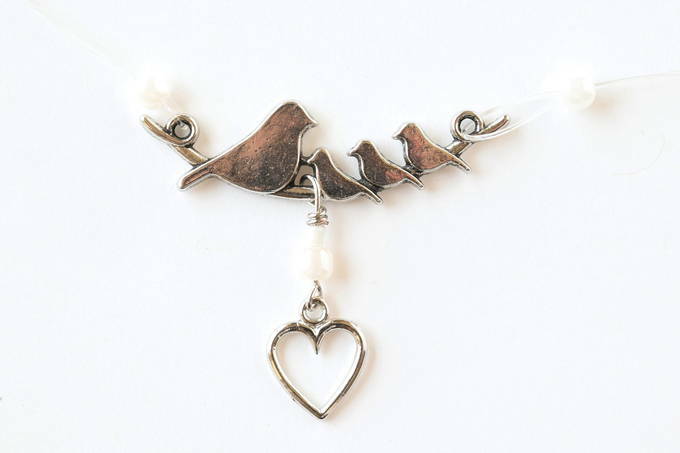 If the wire loop you formed around the bird charm is bent or the eye pin became bent, straighten it. 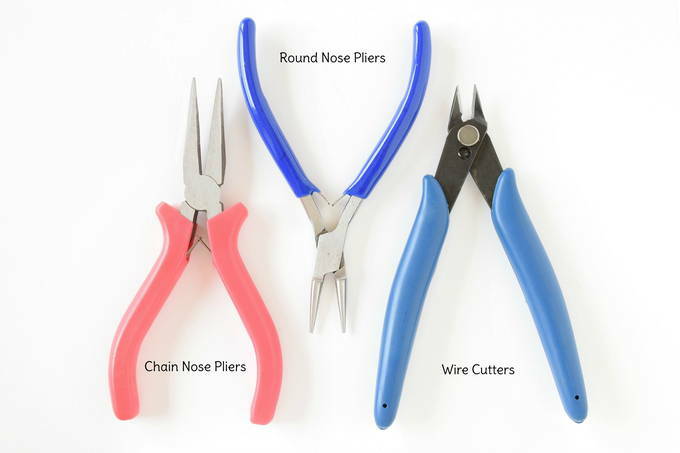 Using the chain nose pliers, open an eyepin’s loop upward, not to the side. Hook it through the earwire’s bottom loop. Press the eyepin loop back into position. For the mom charm, open a small jump ring from the top, not the side. Slide on the mom charm and close the ring. 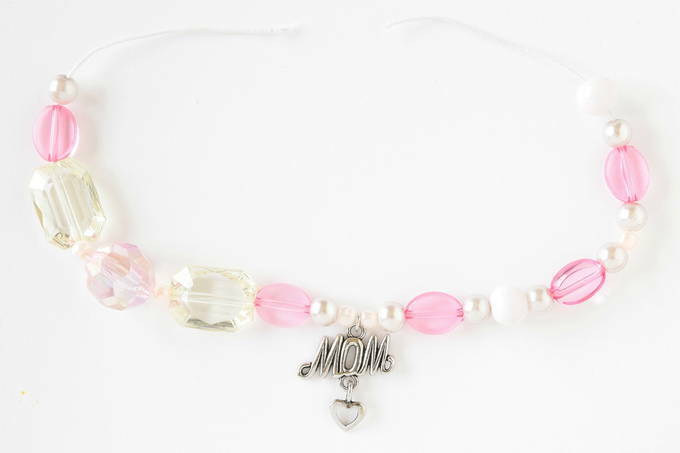 Use the elastic cord to string on the bracelet beads and the charm. Of course, you can change the order of the beads. 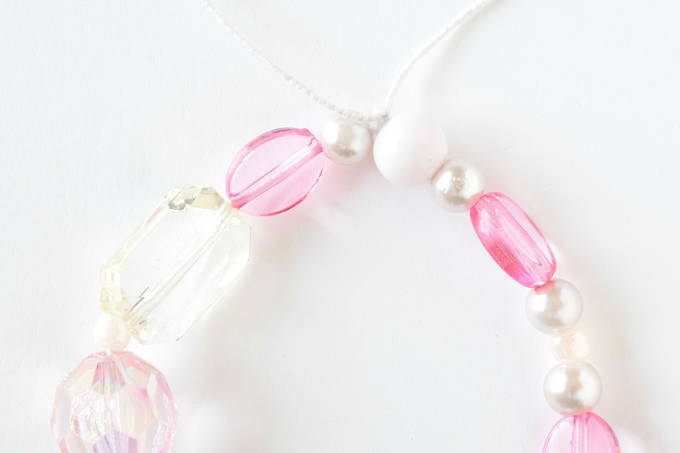 You can either cut the elastic cord to 12” or leave it wound around the package until the beads are all on – so the beads won’t accidentally slide off. You may need to frequently trim the elastic cord end because it will fray. When it frays it’s hard to get through some of the beads. I twisted an end pin in each of the large pearl beads to make sure they had a clear opening. Stretch bracelets are typically 7½”, which is what I made this one. 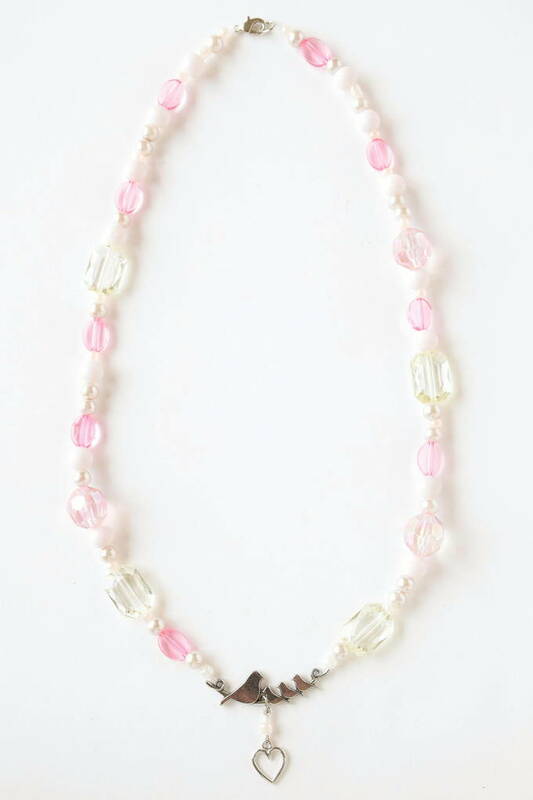 Add or subtract beads as needed to adjust the size you want. Once the beads are on and you’re satisfied with the length, cut the cord leaving 2” on each end. To summarize these directions: Make a surgeon’s knot. Tug on the elastic on both sides of the knot and on each end of elastic. Make a second surgeon’s knot. Again, tug on elastic on both sides of the knot and on each end of elastic. Cut the ends off. Put a dab of E6000 glue on the knot and pull it inside the white bead as best you can. Let it dry. 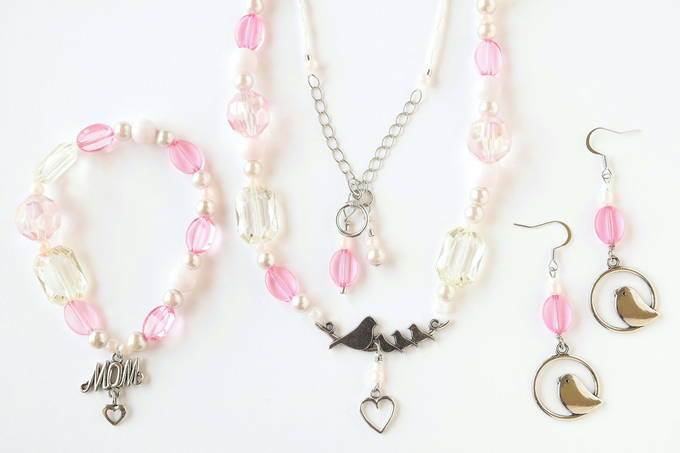 For the heart charm, string the beads on an eye pin and the family bird pendant. Close the end of the eye pin the same way you made the earrings by wrapping it around the exposed wire two times. 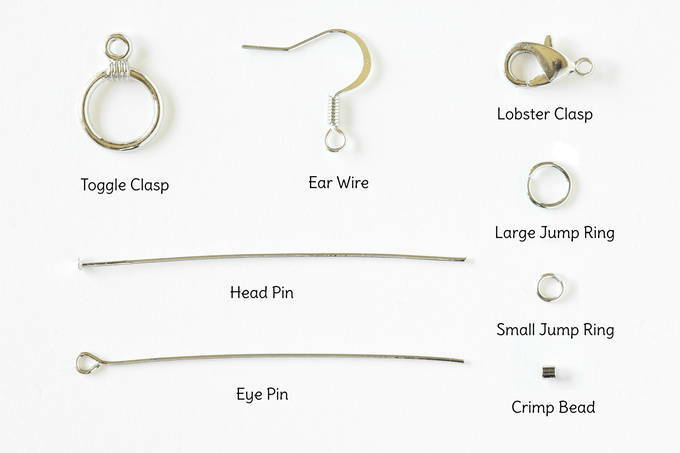 Open the eye pin loop. Attach the heart and close the loop. Cut the thinnest plastic cord 19” long. String it through a large-holed bead, through the loop on the family bird pendant, then back through the large-holed bead. Knot it and pull it tight. Trim it. Put E6000 glue on the knot and pull it inside the large-holed bead. Let it dry. String on the beads to the length you want. My final length was 10½”. Do the same on the other side of the necklace. End both sides with a large-holed bead. 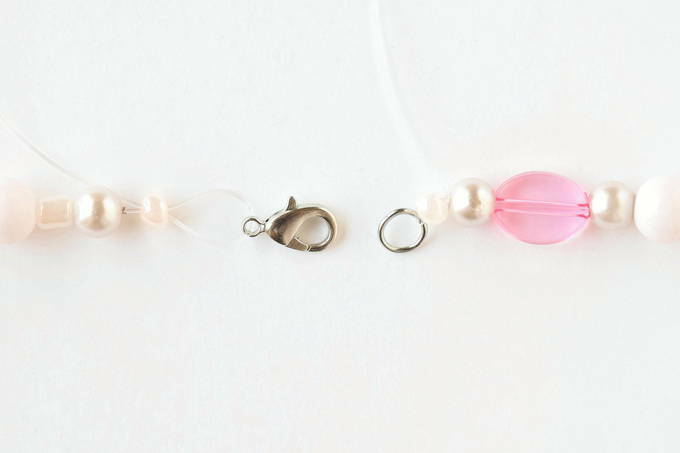 To attach the lobster clasp, string the cord through the loop on the clasp and back through the last large-holed bead. Do the same on the other side with a large jump ring. Tie a knot and pull it tight. Trim it. 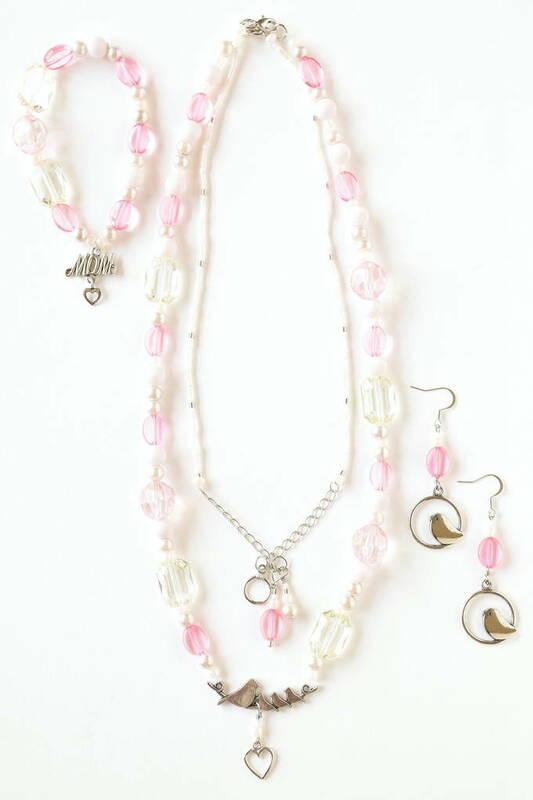 For the pink charm, string the beads, crimp beads, and a small jump ring on a head pin. Close the charm in a loop around the small jump ring. 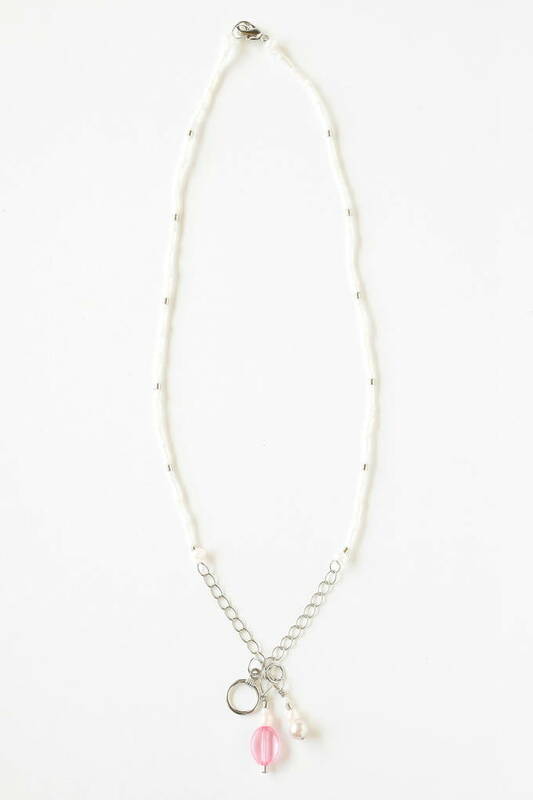 For the pearl charm, string the beads, crimp bead, and a large jump ring on a head pin. Close the charm in a loop around the large jump ring. Cut off half (18) of the chains on the chain string. 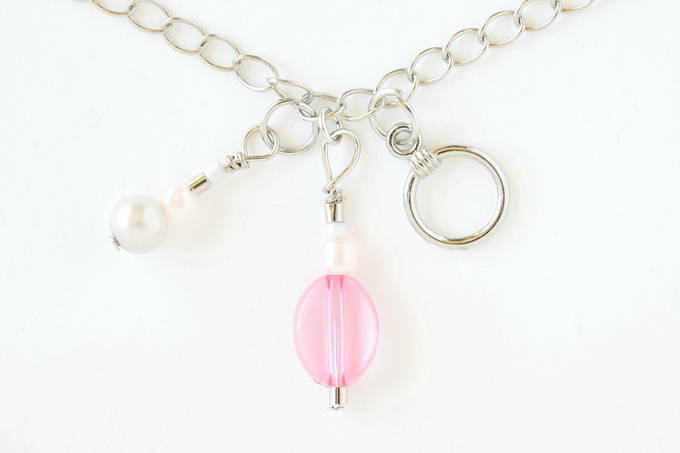 Attach the pink and pearl charm’s jump rings to the center chain of the chain string. For the toggle clasp charm, attach it to a large jump ring. 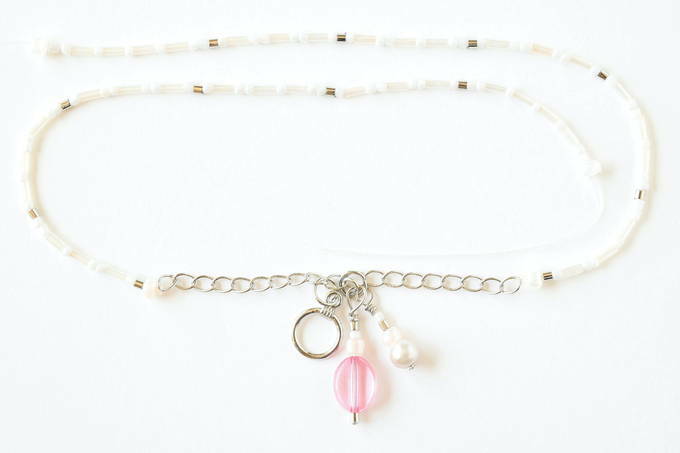 Then attach it to a chain right next to the chain that the pink and pearl charms are on. Cut a 12” piece of the thin plastic cord. 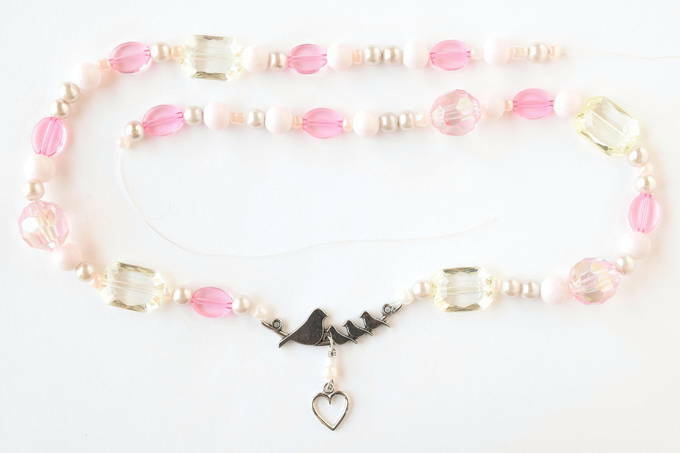 Attach it to the chain string through a large-holed bead just like when you attached the family bird pendant. String on the beads and crimp beads how you would like. End with a large-holed bead. This necklace is shorter and is about 10” long from the clasp to where the charms connect. Attach a lobster clasp and large jump ring to the ends.